TS EAMCET seat allotment 2019 result to be declared, download at tseamcet.nic.in: TS EAMCET 2019 College wise Seat allotment released at tseamcet.nic.in and Download Allotment Order by Signing-In through 'Candidates Login'. TS EAMCET 2019 College Wise Allotment Results/Provisional Allotment List: The Telangana State Council of Higher Education (TS SCHE) has to be released the college-wise Seat allotment details for Engineering, Agriculture and Medical Common Entrance Test (EAMCET) 2019. Candidates who have appeared for and cleared the exam can check their results on the official website of the Council. The eligible and qualified candidates of TSEAMCET 2019 who have not attended for Certificate Verification earlier shall get their Certificates verified from designated Help Line Centers mentioned in Annexure I. The candidates who have participated in first and second Phases Counselling can also exercise options using their old password, Login ID for the left over seats now available and consequential vacancies that may arise in the process of allotment as per the schedule given below, and it is advised to exercise options for interested Colleges assuming that vacancies are available in the course of their choice. Candidates who had qualified in TS EAMCET 2019 and who secured 45% (for OC) and 40% (for others) in group subjects of intermediate or its equivalent examination. • The provisional allotment of seats will be made on ..-07-2019 and will be placed in the website https://tseamcet.nic.in . • For downloading the candidate’s provisional allotment order, enter the ROC Form Number, TSEAMCET Hall Ticket Number, Password and Date of Birth in Candidate login in https://tseamcet.nic.in . • Pay the Tuition Fee mentioned in the Provisional allotment order through online (Credit Card / Debit Card/ Net Banking ) with in the prescribed time and self report through online system in candidates login and take admission number to confirm the provisionally allotted seat. Take the printout. • The candidates with zero Tuition Fee mentioned on provisional allotment order shall perform the self reporting with in the prescribed time through online system in candidates login and take admission number to confirm the provisionally allotted seat. Take the printout. • The candidate at the time of self reporting shall give an undertaking through online that he / she will relinquish the admission through Degree Online Services Telangana (DOST), if any. • If the candidate does not pay the prescribed Tuition Fee within the schedule mentioned, the provisional allotted seat automatically stands cancelled and he / she shall not have any claim on the provisionally allotted seat. • Follow the further instructions printed on the provisional allotment order. • If the candidate cancels his / her admission will forfeit the Tuition Fee paid as mentioned below. ➢ 25% before final phase and 100% after final phase in respect of University Colleges. ➢ 10% before final phase, 50% after final phase and 100% after internal sliding in respect of Private unaided colleges. 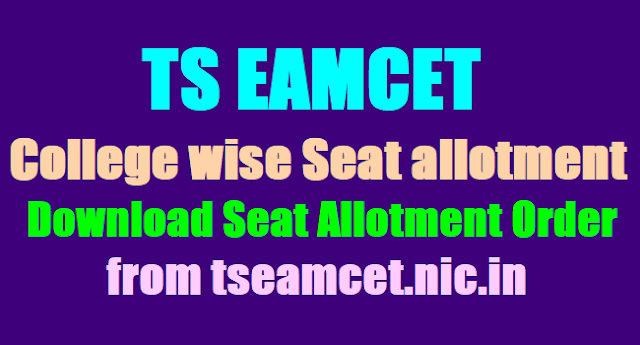 TSCHE has announced the seat allotment result of TS EAMCET 2019 on the official website – tseamcet.nic.in. Engineering, Agriculture & Medical Common Entrance Test (TS EAMCET) is conducted by Jawaharlal Nehru Technological University Hyderabad on behalf of TSCHE. JNTU conducted TS EAMCET 2019 Exam from May ... for admissions into professional colleges of the state adn the results were announced on May ... After, the counselling had begun on May 28. As many as 1.31 lakh aspirants have appeared to take admissions under engineering and technology courses, while another 73 thousand appeared for agriculture and medical programmes. As per reports, last year nearly 9,000 seats remained vacant after the first phase of seat allotment. This year, TSCHE has lower the number of seats from 67,000 seats to 64,300. 1. Online filing of basic information and payment of processing fee: July ..
2. Certificates verification: July ..
3. Web Options: July ..
4. Seats Allotment: July ..
5. Tuition Fee Payment and Reporting to Collges: June ..
1. Online filing of basic information and payment of processing fee: May ..
2. Certificates verification: May ..
3. Web Options: May ..
4. Seats Allotment: June .. The results were announced on May 219 in which total 98,596 candidates were declared qualified in engineering stream. In case the candidates need to receive some information then they can access it through SMS. They need to type TSEAMCET (Counseling keyword) NUMERIC CODE (Code specified for query) XXXXXXXX (Hall Ticket Number) and send SMS to +91 9731979899.